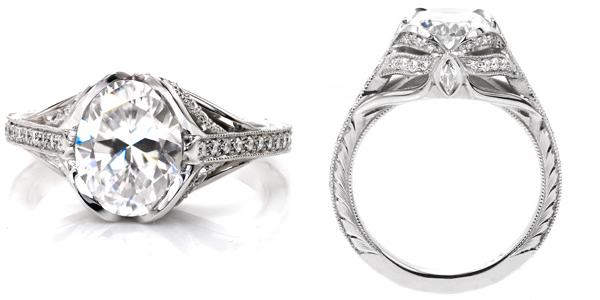 Knox Jewelers has become known for its one-of-a-kind custom engagement ring creations. To maintain this reputation, we are always striving to update our cases with rings that showcase our unique design ability and hand finishing techniques. The latest additions to our inventory are true to this belief, illustrating Knox’s signature creation process with an antique design appeal. Where better to take inspiration then from the timeless beauty and romance of generations past. 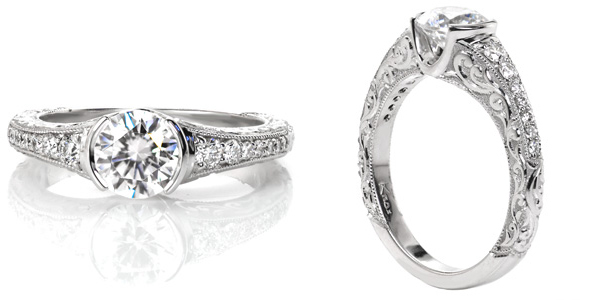 The fascination and enthusiasm for vintage inspired ring settings does not go unnoticed here at Knox Jewelers. The appeal lies in their complicated beauty. Each one is unique with its tapestry of intricate filigree curls, detailed relief engraving and curvaceous silhouettes. Our jewelers hand craft each piece especially to your specifications to ensure your custom engagement ring will be of heirloom quality. 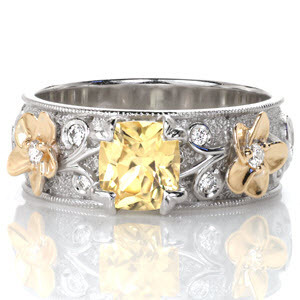 There lies a distinctiveness within an antique inspired ring; they have character. 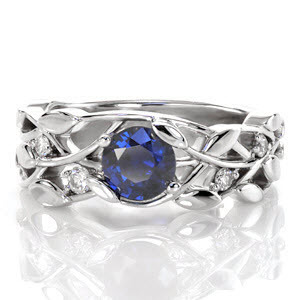 Some may see the uniqueness of their own relationship reflected in singularity of a handcrafted vintage inspired ring from Knox. 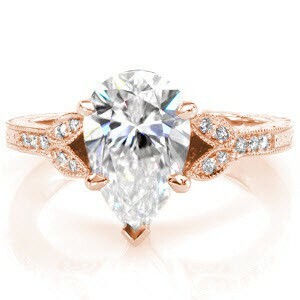 There is something romantic about a ring design created in the past but still desired today. It has endured the test of time. 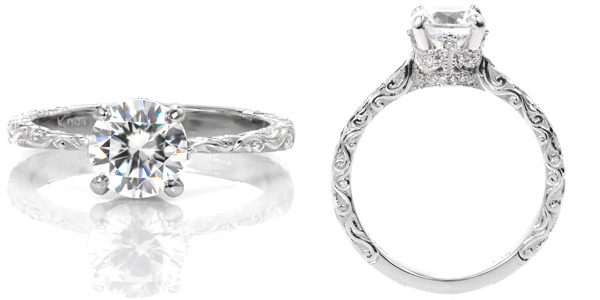 Featured below are our latest additions to our vintage inspired engagement ring settings. Every detail is created by hand and every ring is made from the ground up, especially for you. True to antique form our Adele setting boast an exaggerated profile height , allowing room for pierced cast-in-place filigree work and a surprise bead-set diamond on either side. 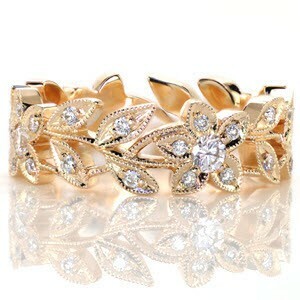 Its center diamond is placed within a hexagon shaped setting and held in place by six prongs. 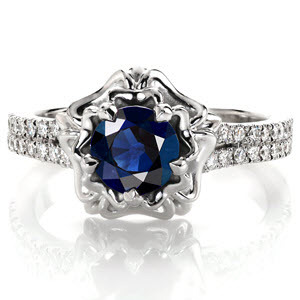 Milgrain edges add the final touch to this Edwardian era inspired ring design. Our Coral ring design negates the notion that a band has to be wide to include intricate detailing. Good things can come in small, tapering packages. This ring features swirl patterned relief engraving with a central gemstone set into diamond encrusted seat. Giving us a bold shoulder, the Sylvia ring design includes large pear shaped side stones that direct attention towards its bezel set center diamond. 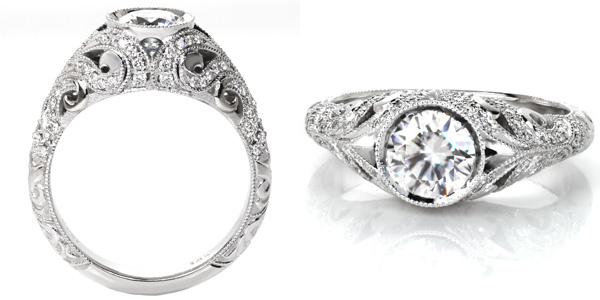 This seamless design incorporates custom filigree pockets within a bead-set arching diamond band. 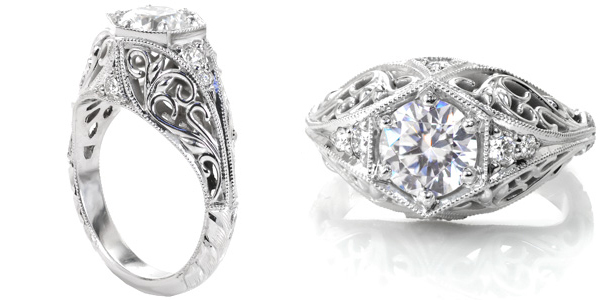 Owing its intricate detailing to not one but several eras of influence, this ring setting is truly something special. The hefty Art Nouveau influence shine through in our Alexandria design. Four delicate petal prongs hold an oval cut diamond in its uniquely crafted center setting. Curving elements and flowing lines emulate the favored artistic details of the era. Bead set diamonds highlight the intricate band and a surprise marquise shaped diamond on either side brings a focus to the ring’s profile view. Befitting its namesake, our Fitzgerald ring design holds design elements inspired by the roaring twenties and its Art Deco movement. A bezel setting allows for milgraing edging to encircle the entire center diamond. Exaggerated scroll shapes lead into an arching band, that from the top view adds a flattering pinched shape. Bead set diamonds and an amble amount of milgrain add a lavish appeal in line with its era of influence. Finally, the best of both worlds is achieved in our Noveau ring design featuring a modern half bezel center stone setting surrounded by elaborate vintage inspired scroll relief engraving. Any of the settings listed above can be crafted as-is or custom tailored to your preferences. 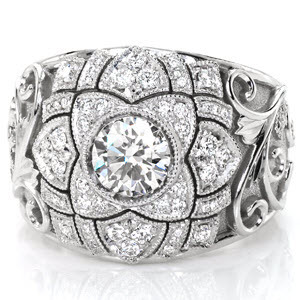 If you would like to incorporate any of the elements from our most recent antique inspired design into your custom engagement ring, contact Knox Jewelers today and we can help you start the creation process. We are experts at taking your vision and making into an heirloom. 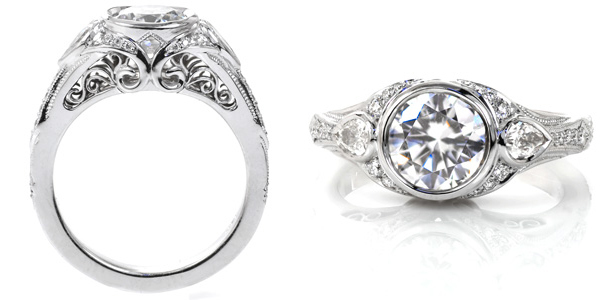 Learn more about designing your own custom antique engagement ring here. 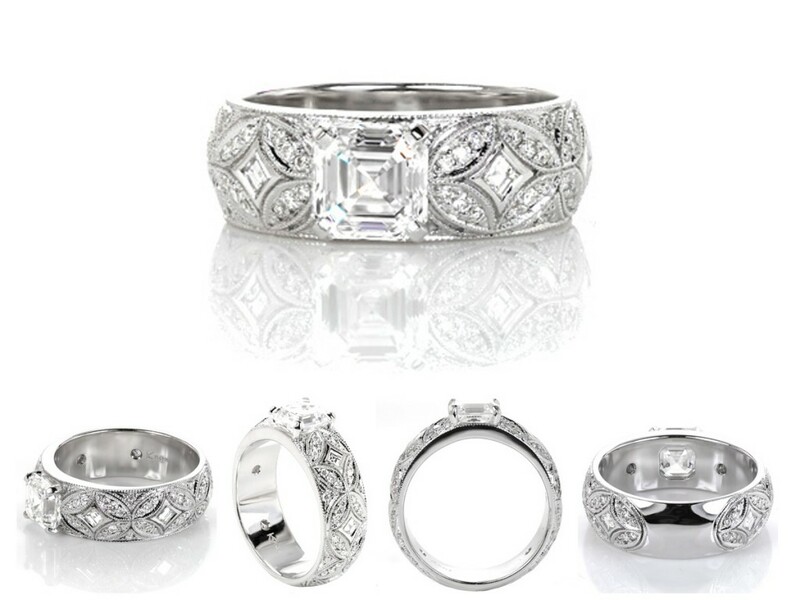 We will work together with you from start to finish to create an antique inspired engagement ring that contains both the visual and emotional elements important to you. 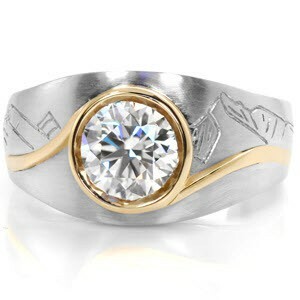 There exists perhaps no experience more fulfilling or significant than being able to design a piece of jewelry which symbolizes the love you share with that special someone and no better place to draw inspiration from than the elaborate ring silhouettes of decades past.